Well, after weeks of anticipating learning some mad dorifto skillz, I ended up bailing from the afternoon half of the drift school today. Kinda anticlimactic. My problem was that I have never learned how to properly drift, and actually learned the exact opposite while doing autocross. 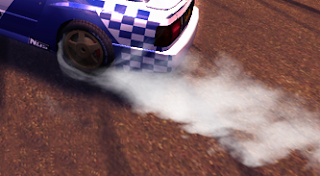 If you're sliding, you're losing time, no matter how spectacularly the tire smoke billows from your wheel wells. Ain't no style points in autocross. So I hoped to learn a bit, but they did not have formal instructors, so I had to rely on whatever random people who looked like they knew a bit about drifting were telling me. With my current setup, the car was not easily provoked into a slide, and even when it slid, I could not keep it drifting long enough. All the "instructors" kept saying that the most effective thing to do would be to clutch-kick. If you don't know what it is, suffice it to say, it will hurt your clutch and potentially the drive train. Yeah, they may want to do that sort of thing in their Nissan beaters. Not in my s2k. Anyways, when I got all my morning runs in, I packed up and went for a mountain drive. That was actually quite a bit more entertaining than drifting. On the way out I stopped to chat with the organizers of the event, who are autocrossers themselves and did not do any drifting today, just put the event together and ran it. Yes, they also shagged the cones, and the drifters did not do any work. I was curious why it was this way, so I asked. Turns out, this was done to specifically cater to the drifters (and wannabes, who were also present in abundance, acting all "fast and furious" like), so they have a venue to practice and don't have to do this at an autocross, where they'd destroy half the course and provide for a bunch of reruns and wait time while the course gets put back together again. If the club holds a couple of these drift events throughout the season, everybody is happy. That of course explains why the "school" was mostly self-taught, since none of the organizers are actual drifters, and could not instruct. So even though the event did not do it for me, I gotta say, neat idea. AT&T, why do you want my SSN to let me use DSL? Hmmm, I love me some P-cars for breakfast!